ASUS’s next generation and high-performance Rampage V Extreme motherboard has been unveiled. The ROG series flagship motherboard features support for Intel’s next generation Haswell-E processors which are due to launch on Friday this week. 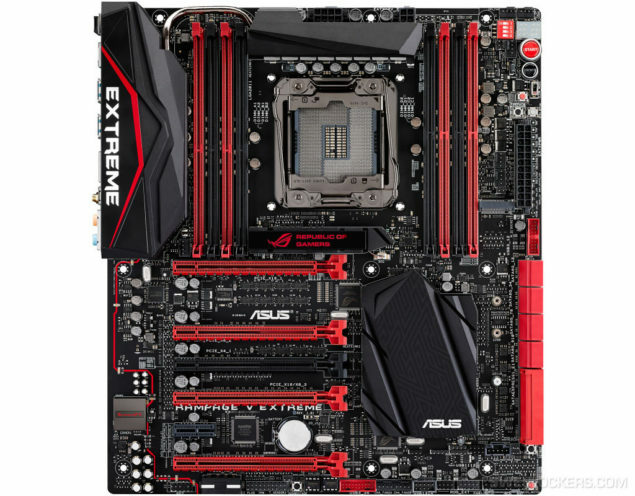 ASUS’s X99 ROG Rampage V Extreme is the most high-end motherboard we have so far seen in the X99 motherboard lineup from ASUS which will also include the X99 Deluxe and X99 WS boards. The ASUS X99 Republic of Gamers based Rampage V Extreme retains the red and black color scheme which is the original color of the ASUS ROG series products. 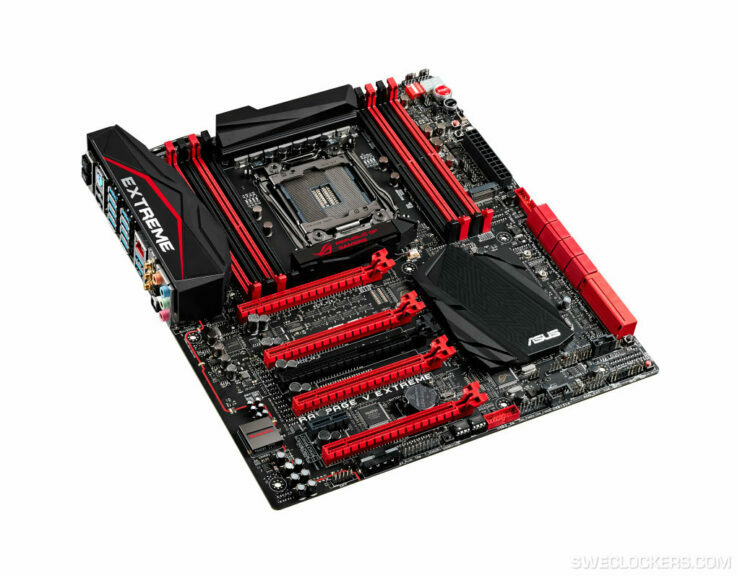 While many other manufacturers have started to follow this color scheme, it was ASUS who originally started the trend of the red and black colored motherboards. Coming back to the specifications, the ROG Rampage V Extreme is a high-end E-ATX sized motherboard which features the LGA 2011-3 socket which will support Intel’s Haswell-E processors which include the Core i7-5960X, Core i7-5930K and the Core i7-5820K. The X99 ROG Rampage V Extreme will feature a 8 Phase Digi+ VRM design which boasts several quality grade components to ensure superior stability and overclocking performance. The VRM is surrounded by a large heatsink at the back of which, an 8 + 4 Pin EPS connector configuration can be found to provide power to the LGA 2011-3 socket. The socket is surrounded by eight DDR4 DIMMs which offer up to 128 GB of memory support with speeds of up to 3300 MHz at 1.35V. The heatsink is interconnected with a I/O panel thermal shielding through a heatpipe which has a large “EXTREME” label engraved on it. The motherboard has four sets of heatsinks. Two for the PWM and I/O Panel, one below the socket and the last one is featured on the X99 PCH. The heatsink below the socket lits up the Republic of Gamers logo in red color when the motherboard is powered on. There are a few OC switches configured along side the 24-Pin ATX connector which include a PCI-e ceasefire switch, Diagnostic LED, MemOk, BIOS Reset, LN2 Mode and Start On/Off switches. There’s also a small M.2 slot configured along side the connector which runs down to the length of the SATA ports. 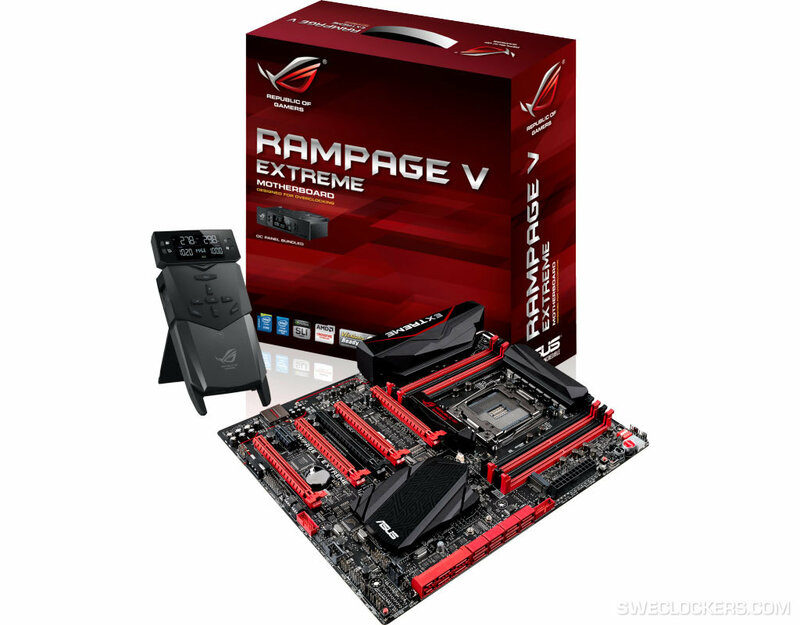 For storage, the Rampage V Extreme includes 12 SATA 6 Gbps ports and two SATA Express ports. There’s also two USB 3.0 headers and two USB 2.0 headers. Expansion slots include five PCI-e 3.0 x16 slots and an open-end PCI-e 3.0 x1 slot. The SupremeFX audio chip is isolated on its own PCH indicated by a red colored line and offers hd audi through the 7.1 channel audio jack at the I/O panel. 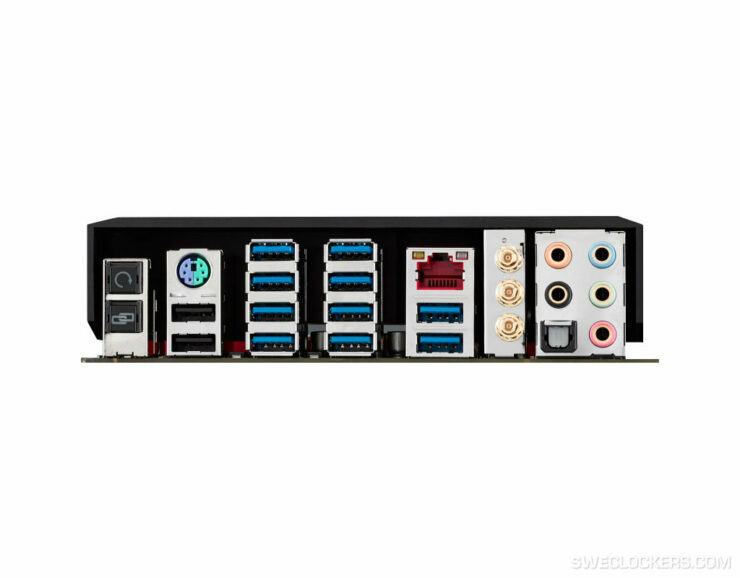 The I/O panel is loaded with ports which include 10 USB 3.0, 2 USB 2.0, a Gigabit Ethernet LAN port, WiFi AC connector, 7.1 Channel audio jack, reset button and a ROG connect button. ASUS bundles the ROG Rampage V Extreme with the OC Panel which is an enthusiast grade overclocking tool built for overclockers offering easier accessibility to several overclocking tools and utilities which can be configured in real time. The pricing for the board is not known at the moment but we can expect a $450+ US range for this bad boy.